GC gear coupling is a torsionally rigid coupling, which can transmit a high torque when compared to its physical size. The crowned gearing can compensate for angular and radial misalignments between the shafts, and even long axial strokes can be achieved by altering the gearing length. 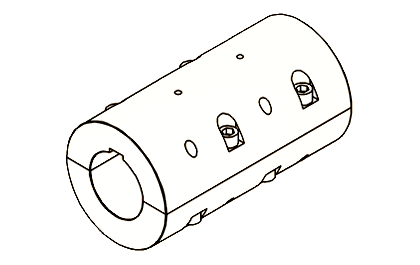 The gear coupling is thus considered a flexible coupling. Torque is typically transmitted from the shaft to the coupling by a keyway and a fitted bore joint, and from the hub to the sleeve by the gearing. Torque is then transferred between the two coupling halves and thus from the driving machine to the driven unit by a flange joint. 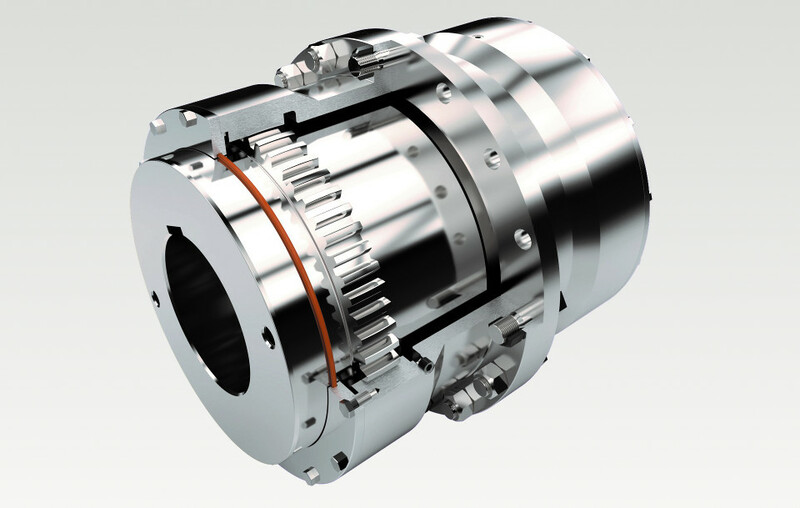 The gear coupling has a very long lifespan, when correctly dimensioned, and it is easy to tailor to fit almost any drive. GC gear coupling line-up covers shaft sizes 150-1000 mm, and torques up to 16 000 000 Nm. Modern and flexible manufacturing methods make it possible for PTG to supply customized solutions with a quick delivery time. Special materials and heat treatments are available on request. CGC Engagement claw coupling is one of the modifications of gear couplings. It is quite often used to connect auxiliary drive to be used in maintenace of the rotating machinery. For this speciality our product range is growing. DPC metal discpack coupling is a torsionally rigid and backlash-free shaft coupling, which can compensate for medium angular and radial misalignments between the connected shafts. The all-metal construction is not susceptible to heat, and is maintenance free, so the coupling is especially well suited for drives where traditional rubber element couplings can not be used due to heat or high drive torque. 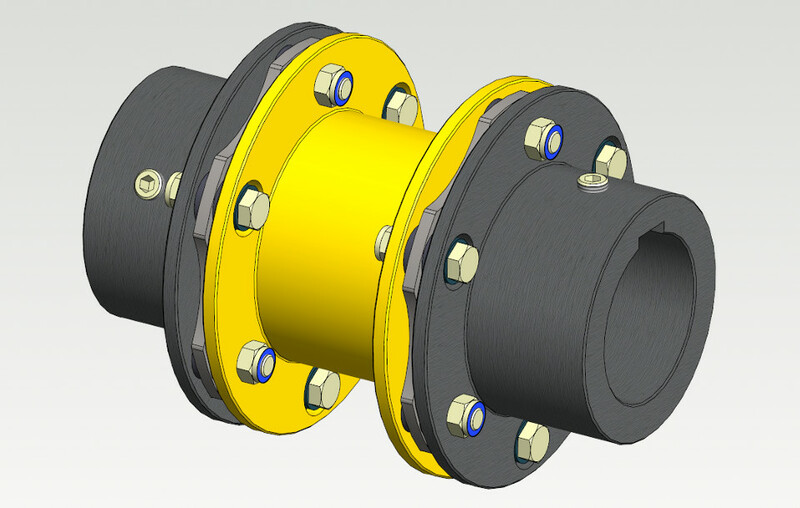 A correctly installed and dimensioned discpack coupling lifetime is at least as long as that of the connected machines, and it requires no maintenance apart from visual inspection. The discpack can be inspected when the machine is running with a strobe light. The PTG DPC metal discpack coupling line-up covers shaft diameters 20-135 mm, but larger sizes are available on request. The DPCC version allows for a short distance between shaft ends (DBSE), and is equipped with a split spacer so that the machines do not need to be moved when changing the discpacks. The DPCC may also be used to replace a gear coupling, if maintenance free operation is desired. Hub assembly with key-less locking device is also available. SPC shear pin coupling is actually a part of a coupling, which can be integrated with another type of coupling, such as a gear coupling. The purpose of the shear pin coupling is to quickly disengage the driving and driven machine from one another, in case of a sudden problem such as a short circuit. The shear pin can be customized to provide different shearing torques, which should always be some what higher than the highest maximum operating torque of the drive during start-up, for example. The most common application for the SPC shear pin coupling are different test benches, where unexpected disturbances are common. SPC coupling line-up covers shear torques of 5-140 kNm, but higher torques are available on request. The SPC unit is comprised of own standardized parts and bearings, so that the same spare parts and pins can be used in different couplings. TK pin coupling is a tried and tested coupling, which has been found very reliable. The design allows for large angular, radial and axial misalignments between the connected shafts, and also dampens vibrations. The pin coupling is especially popular in the mining industry, has a very long life time and requires no maintenance apart from visual inspection of the flexible elements. The flexible elements of the TK pin coupling can be changed without moving the connected machines, and are available in different materials for different operating conditions. The TK pin coupling line-up covers couplings up to 2000 mm in diameter, and the design can easily be customized to fit different drives, such as test benches. The coupling can also be combined with an SPC shear pin coupling, to provide a fail safe for the drive in case of sudden problems. The TKR coupling's axial movement is limited so the coupling may be used with electric motors, which are equipped with slide bearings. NEW; Polyurethane (PU) Bushes are available, 1.5 times more torque. Ask more! KKT clamp coupling is a simple, rigid coupling for joining two machines together, or to be used as a shaft extension. The most common applications are overhead cranes and different drives in the saw mill industry, and also vertical mixers. The DIN standard clamp coupling is made of cast iron and is relatively large, where as the MFG KKT clamp coupling is made of steel. This steel coupling is backlash free and much smaller than the DIN standard coupling, so it is especially well suited for drives with space limitations or high rotation speeds. The coupling can be installed and disassembled without moving the machinery, and is maintenance free. KKT clamp coupling line-up covers shaft sizes 30-150mm, but larger models are available on request. Different materials, such as stainless steel, are also available. Vertical drives can be equipped with the KKT3, which is fitted with a limiter plate inside the coupling. A lower cost model with small gac between the halves is also available. FC Flange coupling is more or less for the same purpose. It ia able to carry bending moment and therefore used in applications where driving gearbox and electric motor is on "hanging" on a driven shaft. Sizes up to 600 mm shaft dia are availble.